(Japan Times) – Prime Minister Shinzo Abe ordered economic revitalization minister Nobuteru Ishihara on Tuesday to draft a range of economic measures to bust deflation and raise Japan’s growth potential, including with a supplementary budget for fiscal 2016. The government will submit the budget draft for fiscal 2016 to an extraordinary Diet session this fall, Ishihara told a news conference later in the day. On Tuesday, the Nikkei financial newspaper reported the projects are likely to be worth about ¥10 trillion, including the supplementary budget and government-backed loans to businesses. Ishihara said the budgets will likely benefit workers at nurseries and day care services for the elderly, but he declined to give any further details. “The aim of the economic measures is to make investments for the future,” Ishihara said. However, the list of planned projects also includes public works projects that are often used as sweeteners for the construction industry and to reward local politicians who helped secure the LDP’s election victory. In a written instruction to Ishihara, Abe ordered the minister to accelerate construction of maglev railway lines and to expand the nation’s shinkansen bullet train network. There will also be spending on measures to help farmers and fishermen export their products, the paper said. Abe urged Ishihara to take advantage of the negative interest policy recently introduced by the Bank of Japan, which would lower borrowing costs for the already debt-ridden government. This means Ishihara was urged to issue more public bonds to finance the projects, further adding to government debt. Japan’s public debt amounts to more than 200 percent of gross domestic product, the highest of all developed countries. But Ishihara emphasized that the government needs to do what it can to stimulate the economy and end deflation, which would then lead to economic growth and lower the ratio of debt to GDP. (Bloomberg) – Mark Carney looks poised to repeat a strategy that served him well during the global financial crisis. As the Bank of England governor seeks to stave off any turmoil after Britain’s decision to quit the European Union, he has cited his experience at Canada’s central bank in 2008 as a guide. Acting early to prevent a deeper downturn became the hallmark of his approach in the prelude to the international slump, a perspective he can bring to the Monetary Policy Committee’s debate this week on whether to cut interest rates. With Brexit roiling currency markets before a 2.6 percent rally in the pound this week, confidence gauges diving and Carney warning of a “material slowdown,” economists and investors see more stimulus on the way. The governor is still at the vanguard of Britain’s response as the government remains sidetracked by a change of leadership in the ruling Conservative Party. Carney said shortly after the referendum that easing will probably be needed this summer, meaning the focus now is on whether officials act this week or wait until their Aug. 4 meeting. The advantage of the later date is that the BOE will publish new forecasts in the quarterly Inflation Report and the governor is due to hold a press conference. (Zero Hedge) – Speaking overnight in Australia, the Fed’s Loretta Mester said “helicopter money” could be considered to stimulate America’s economy if conventional monetary policy fails. As Australia’s ABC reports, Mester, president of the Federal Reserve Bank of Cleveland and a member of the rate-setting Federal Open Market Committee (FOMC), signalled direct payments to households and businesses to stoke spending was an option if interest rate cuts and quantitative easing fail. “We’re always assessing tools that we could use,” Mester told the ABC’s AM program. “In the US we’ve done quantitative easing and I think that’s proven to be useful. “So it’s my view that [helicopter money] would be sort of the next step if we ever found ourselves in a situation where we wanted to be more accommodative. The surprising comments from a Fed hawk, come on the heels of two other Fed presidents hinting that more QE could be used as additional “ammo” should the US economy relapse back into recession, and as major central banks consider unconventional policy tools in a world of slowing growth, low inflation and record low interest rates. Mester said that concerns about the Brexit vote were a consideration in June when the Federal Reserve left rates at between 0.25 and 0.5 per cent, a consideration While the immediate impact of Brexit rattled financial markets, Mester said the Fed would be looking to medium and long term fallout. “Between now and our next meeting and future meetings we are all going to be assessing what the impact of that decision will mean in terms of economic conditions and how they affect the medium term outlook for the US economy,” she explained. 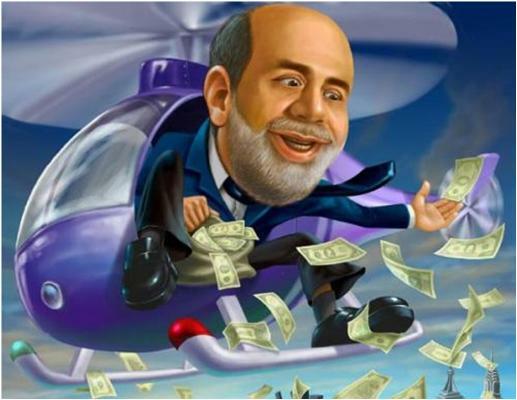 And if all else fails, there is always Bernanke’s helicopter, first in Japan then coming to the US. Japan has an “economic revitalization minister”? That seems like an admission of defeat right there, since the name implies an economy that (under current leadership) isn’t vital. But hey, at least it’s honest, unlike the US where the numbers are cooked to show vitality where there is none. “The budgets will likely benefit workers at nurseries and day care services for the elderly, said [Japan’s] Ishihara. ‘The aim of the economic measures is to make investments for the future’.” Really, day care for the elderly is an investment? This illustrates the debasement not just of currency but of language, when anything a politician thinks will buy votes can, with a straight face, be called an investment. That picture of Bernanke doesn’t convey any new information but it’s such a great example of parody revealing underlying truth that it deserves to be reprinted every few months. The idea (now being pushed by a surprising number of people who ought to know better) that governments should take advantage of historically low interest rates to “invest” with borrowed money has an obvious fatal flaw. That is, accumulating even more negative or zero-rate debt will make it functionally impossible to raise rates to “normal” levels, which is to say levels where markets can once again function as mechanisms for moving savings into productive investments. It’s not a stretch to call this the end of capitalism and the beginning of a new Dark Age. The coming experiments are of course not the end of the process. A full-on debt jubilee is still out there, and will be tried after a simple ramp-up of fiscal/monetary stimulus fails again. Be prepared for governments to start buying our houses at double the market price in 2017.